RAV4 is one of Toyota’s best selling models on the U.S. market. As such it is the one that generates the most money. It is surprising, but true, that it fares much better than Highlander, Corolla, and Tacoma. This is why the Japanese automaker is doing everything it can to make 2019 Toyota RAV4 even better than it’s today. 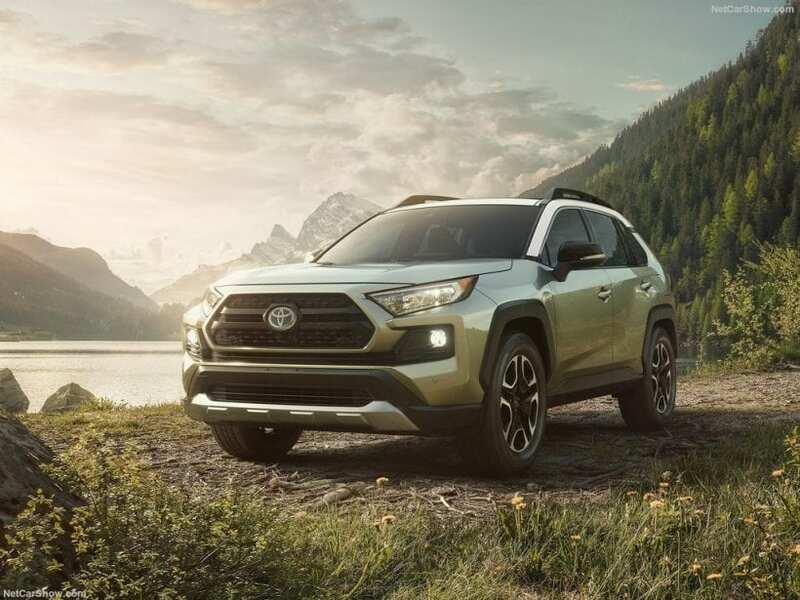 The U.S. market and RAV4’s popularity are the main reasons Toyota decided to present new model at New York Auto Show, rather than in Geneva as it was planned. New 2019 RAV4 is here, and it looks better than ever. It is a mixture of Highlander and 4Runner. A perfect mix, at that. What Toyota managed to do with this SUV is to give it a longer wheelbase, but also to make it shorter overall. It got bit wider, but it’s also lower than before. Up front, it has a new bulky grill flanked by side vents similar to what 4Runner offers. It is a bit sharper on the edges with that dose of Highlander curves. The side glasses on all windows look connected similarly to the ones that you can see on Toyota Highlander, but also on the competitor such as Jeep Grand Cherokee. Don’t worry; this is not a copycat vehicle. 2019 Toyota RAV4 is a unique as it can get, it just looked up a bit to its surroundings. The aggressiveness which comes with new model separated it from the previous installments, and we believe that this was the right approach to take. Depending on the trim of your selection, the design will also differ. Every version, Limited, off-road Adventure, and Hybrid have different styling which is also an interesting take on this vehicle from Toyota. On the inside, the offerings also depend on the trim of your selection. But, what comes with every model is class and comfort. The infotainment system is positioned high on the dashboard. 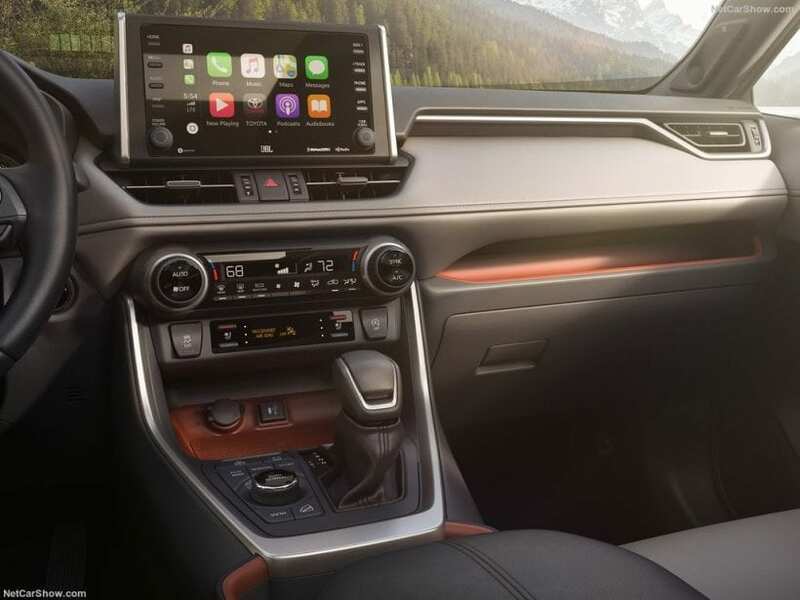 All trims have the same Toyota Entune 3.0 suite, and this system comes with Apple CarPlay. On the sides of the primary display, you have control buttons and knobs which are easy to use. In the lower segment of the dashboard, you will find climate control. 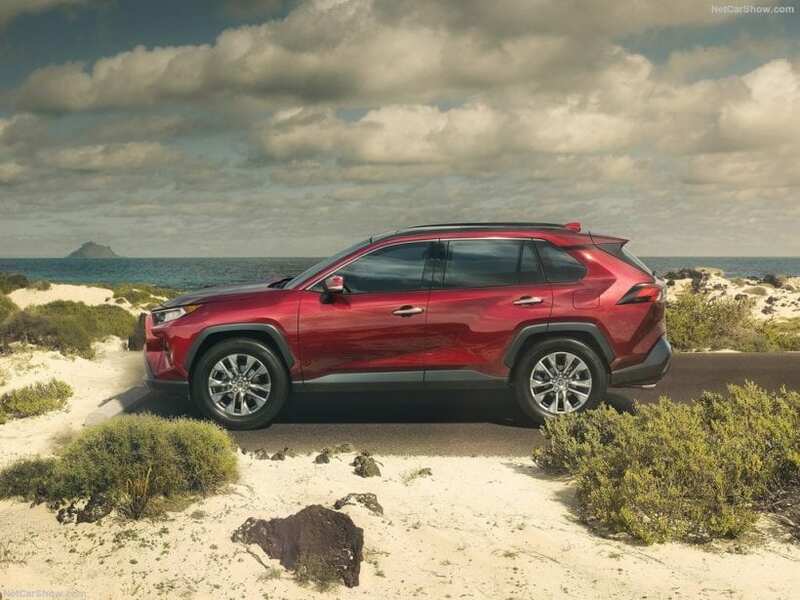 Out of safety features, 2019 Toyota RAV4 has Safety Sense 2.0 which includes pre-collision warning and prevention with pedestrian detection, full-speed active cruise control, lane departure warning and assist and automatic high beams. What separates this year’s Safety Sense, from the last year’s edition, is Lane Tracing Assist. 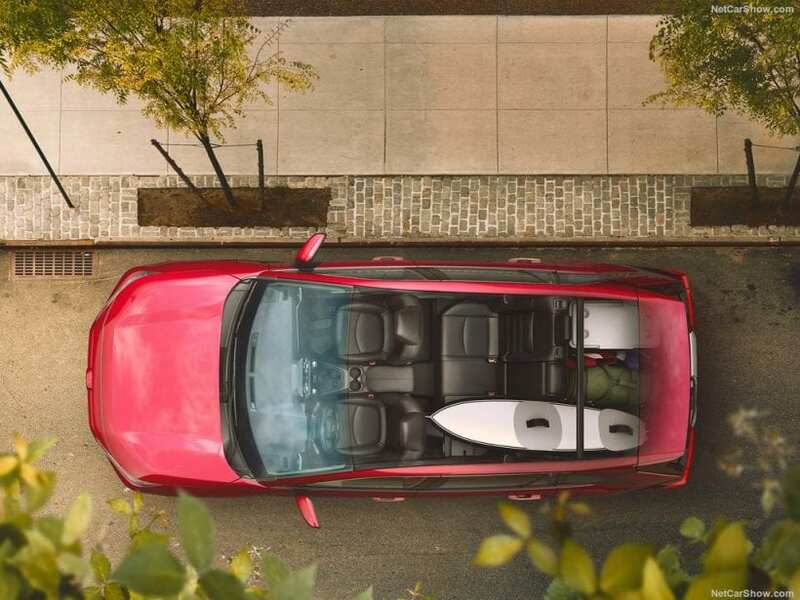 All in all, new RAV4 sticks to the old but reliable recipe. Five passengers and lots of cargo space. Under the hood, you will find a 2.5-liter 4-cylinder powertrain, or in a hybrid case, electric motor tied to the same engine. This new 4-cylinder unit goes under the name “Dynamic Force,” and it sends the power either to the front or all four wheels. The transmission available with five gasoline-powered models is an 8-speed automatic. The Hybrid version uses a CVT (continuously variable automatic transmission) and Toyota Hybrid system II on the four available Hybrid trims. 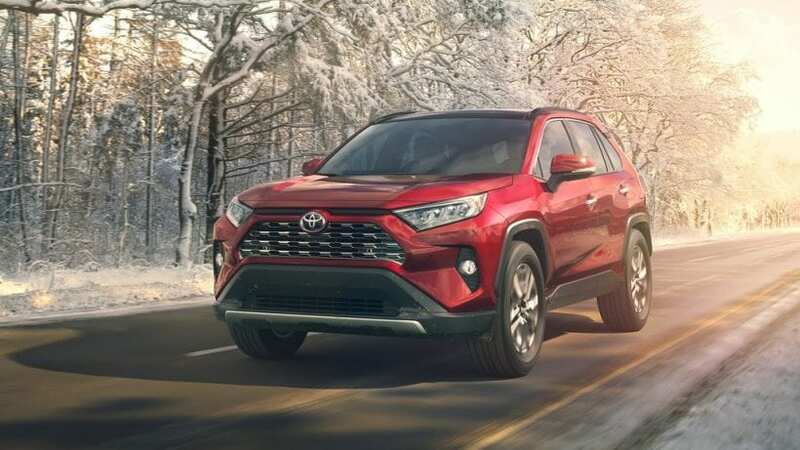 Like we already mentioned the new 2019 Toyota RAV4 was presented at New York Auto Show in March. It will be available in the dealerships before 2018 makes a turn. The first version to hit the roads will be the gasoline ones. The Hybrid is not expected until the beginning of 2019. The price wasn’t the subject when the new model was introduced in New York. It remains to be seen how much will the new design, and tech upgrades cost. More on the figures will be known as the release date approaches. For all of you who can’t wait for the new version, the ongoing generation of RAV4 is priced at $25,500 for the entry LE trim. The top-tier Platinum is $37,200. XLE Hybrid version stats with $30,000.